It’s no secret that the year end appeal is an important element of the annual development program, and can be a large revenue producer for many organizations. No matter what your development program looks like, you’ll learn how you can implement a year end appeal that not only raises the dollars you need, but also continues building relationships with your donors. 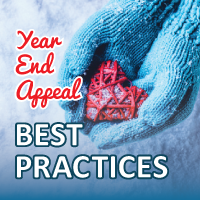 You’re going to do a year end appeal – why not do it right?